Lindauer and Goldie, the Dominion Museum and the Polynesian Society: the story of artists and collectors engaging with the Maori world in turn-of-the-century New Zealand. 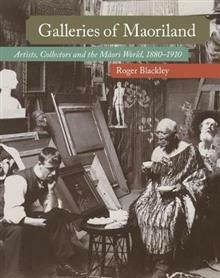 Galleries of Maoriland introduces us to the many ways in which Pakeha discovered, created, propagated and romanticised the Maori world at the turn of the century - in the paintings of Lindauer and Goldie, among artists, patrons, collectors and audiences; inside the Polynesian Society and the Dominion Museum; among stolen artefacts and fantastical accounts of the Maori past. The culture of Maoriland was a Pakeha creation. But Galleries of Maoriland shows that Maori were not merely passive victims: they too had a stake in this process of romanticisation. What, this book asks, were some of the Maori purposes that were served by curio displays, portrait collections, and the wider ethnological culture? Why did the idealisation of an ancient Maori world, which obsessed ethnological inquirers and artists alike, appeal also to Maori? Who precisely were the Maori participants in this culture, and what were their motives? Galleries of Maoriland looks at Maori prehistory in Pakeha art; the enthusiasm of Pakeha and Maori for portraiture and recreations of ancient life; the trade in Maori curios; and the international exhibition of this colonial culture. By illuminating New Zealand's artistic and ethnographic economy at the turn of the twentieth century, this book provides a new understanding of our art and our culture. Roger Blackley is an associate professor in art history at Victoria University of Wellington. From 1983 to 1998 he was the curator of New Zealand historical art at Auckland Art Gallery for fifteen years. He is the author of a number of books, including the bestselling Goldie (Auckland Art Gallery/David Bateman, 1997).